Tightwad found this on designdazzle. 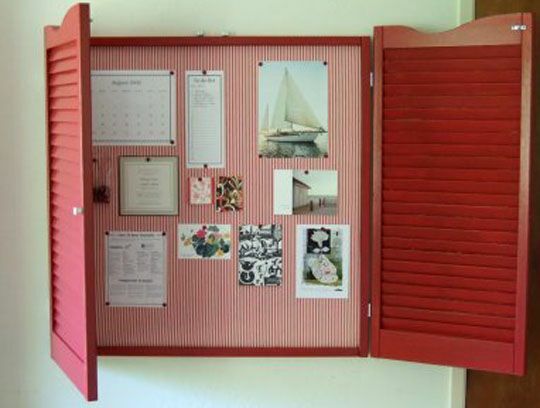 What a great way to reuse old shutters! I like this! This reminds me of the kitchen in the first home I owned. A room had been added on to the house behind the kitchen, and where there had once been a kitchen window over the sink (that would have looked into the new room), the previous owner had built a small shelf, much like a medicine cabinet. The doors on it were shutters. Sounds odd, but it was really kind of cute. Love this shutter idea. I would think you could even find used shutters at garage sales or at the curb side on trash day.One man's trash is another's treasure! Oh my god - I love that!! What an excellent idea.